Chinese food and water soccer. Wait. What? Oh lord was this ever a rough night. A rough, rough, hysterical, rough night. Wednesdays are always bad because they’re garbage nigh, and I HATE garbage night. I hate sorting through all the bins in the house to separate organics from garbage and recycling in order to maintain the 1 77L bag minimum. I don’t hate why I have to do this, and I completely agree with the program itself. That said, I HATE garbage night. This was an especially bad garbage night though. Oliver kept trying to sneak into the laundry room where the litter box is, and after the incident a few weeks prior this really has to be watched. I guess that needs an explanation as well. So, I was cooking dinner a couple of weeks ago while Oliver wandered around playing with god knows what in the other room. Then I didn’t hear him for a few minutes. I figured he was just sitting on the floor with a puzzle or something. I hadn’t yet learned that when it’s quite, well, that’s when you have to worry the most. 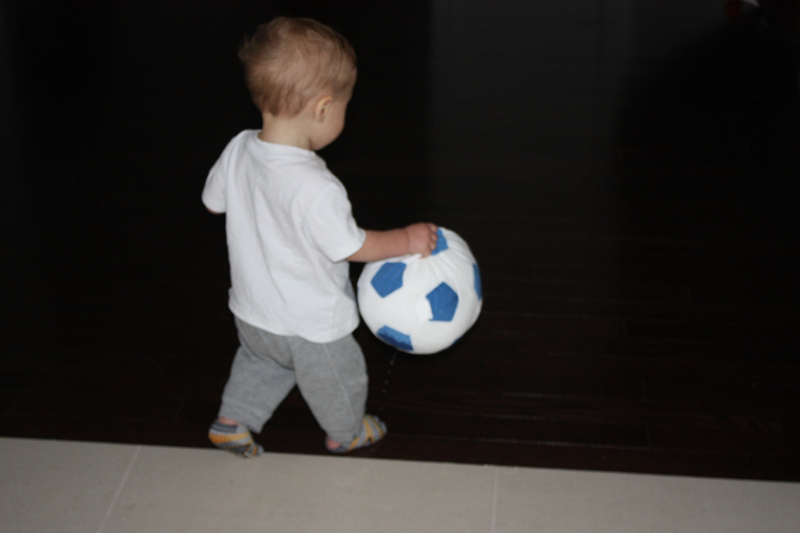 Then, I heard the unmistakable “Ping” of something hard hitting tile, like a piece of metal, or a rock…I bee-lined it down the hall to see Oliver standing at the door to the laundry room, his mouth and hands absolutely covered in red. It looked like he had just committed a mass murder. What really gave him away though were the two “rocks” in each of his hands. You see, I have this little glass jar that used to sit on top of the litter box and it’s filled with this rocks covered is some sort of red substance that smells like berries, to try and hide the cat smell (nothing really hides that smell especially well though). Well, Oliver had figured that if they smelled good, they must taste good, but he was wrong. Oh lord, was he wrong. When I picked him up and starting scoping around in his mouth to make sure nothing was left in there he started covering me with hugs and kisses, which usually I’d be all over, but tonight meant that I was covered in berry sent and colour too. That berry scented red die was EVERYWHERE. It was all over his hands and up to his elbows, in his mouth, all over his face, all over my hands and my face, and all over our clothes. It stained too. Of course it did. Even after we’d both had a bath and been well scrubbed we still smelled like berries for two days. I never wanted to eat another berry as long as I lived, until they were on sale shopping that weekend. So, Oliver was playing and I was trying to gather the garbage, and had actually finished upstairs and was moving into the kitchen and cleaning out the fridge. Now, I’m a creature of habit, and every other week I’ve started with the kitchen and worked upstairs. I completely believe that what happened next only happened because I switched up the order. I had a bunch of left over Chinese food in the kitchen from Bo’s late nights at work. I only got it because Oliver likes it, I swear. Anyway, when I ordered the Chinese I accidentally ordered a giant dish of bean sprouts in some weird sauce instead of plain noodles. I don’t know how that happened, I must have been tired. Anyway, I didn’t like them so the whole thing was in the fridge (minus one bite) along with fried rice and teriyaki chicken. 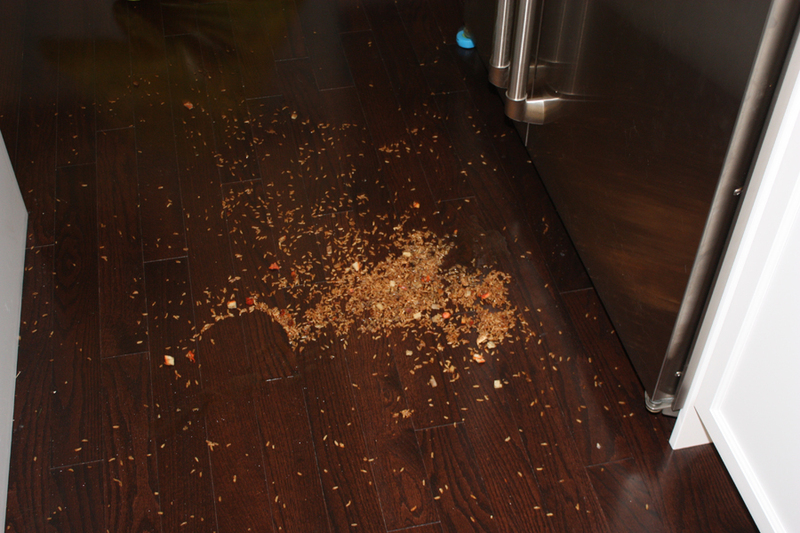 When I was taking them out of the fridge, complete klutz that I am, I dropped them. That really doesn’t accurately describe what happened there. I forcefully threw them downward somehow, on a slight angle back toward the fridge that ensured the dishes smashed against the meat drawer, causing the lids to fly off, and ensuring optimum spread of rice, chicken, and sauce all over the interior of my fridge and the floor. You know what though, I caught those bean sprouts. Thank god for small mercies. Any way, I was already so exasperated from the garbage at this point, and the fact that I still had to cook dinner, that this was really the last thing I needed. But what can you do right. I learned a long, long time ago that it’s best to just laugh at my clumsiness. So, I grabbed a roll of paper towel and begin cleaning up the Chinese food. Then I heard a splash, and some grunting, coming from the powder room. First I was like “Yes! 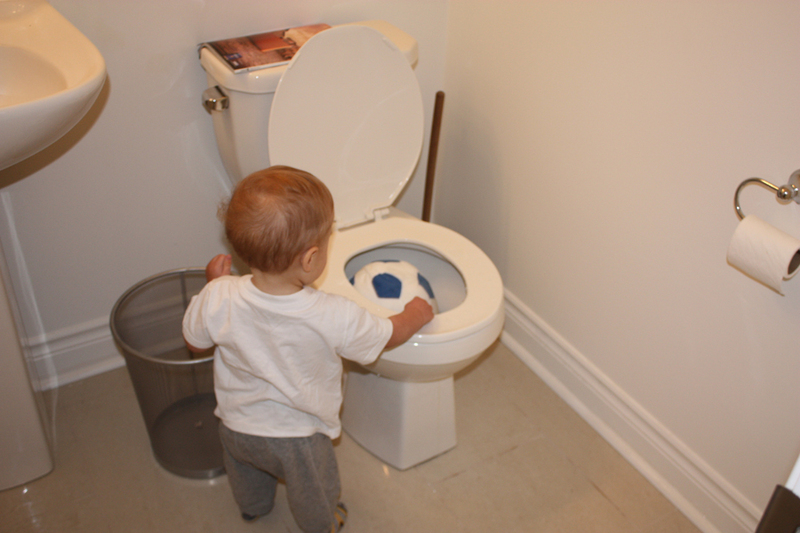 Oliver potty trained himself!”. 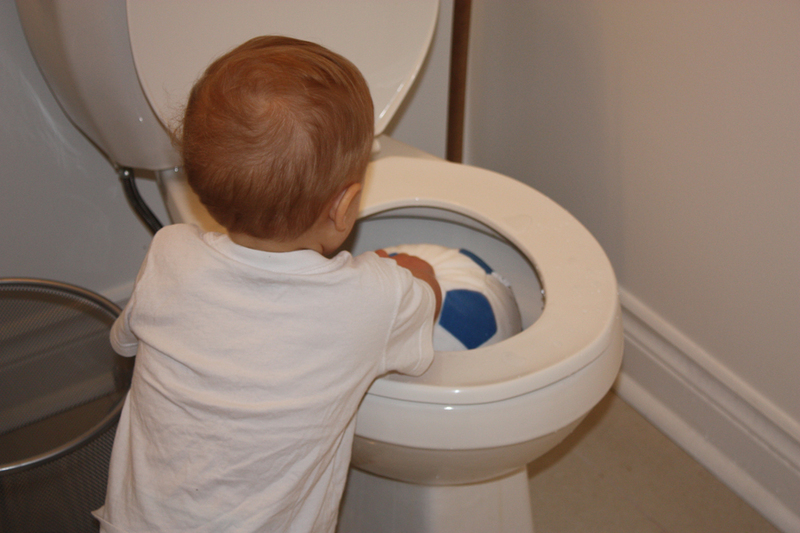 Then I remembered that he’s 14 months old and doesn’t even understand what a potty is. Then I realized I was in a load of trouble. 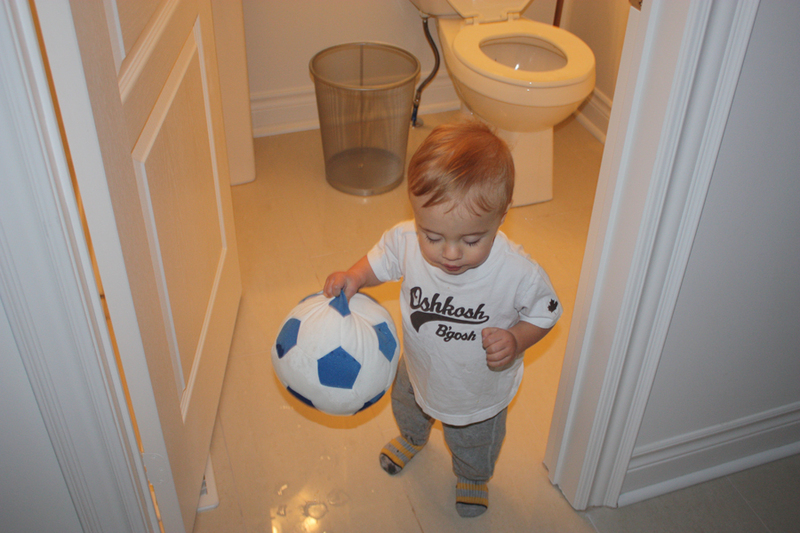 I scuttled off to the front hall, only stepping in one puddle of sauce (which required me to walk on the side of my right foot), to see Oliver walking out of the bathroom with a stuffed soccer ball dripping with water. 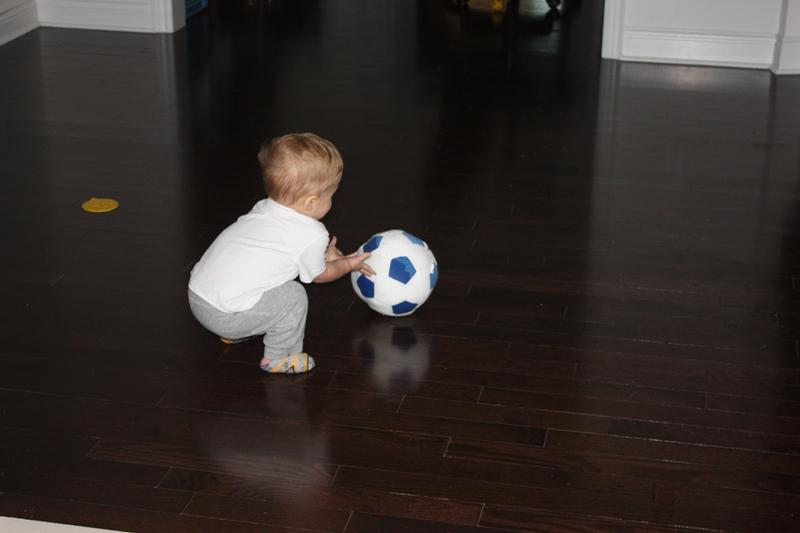 Then he put it on the hardwood and tried to roll it around, amazed that it didn’t act the same as it had a few minutes earlier. It was about this time that I noticed just how much water was all over the floor. Clearly Oliver had been at this for a couple of minutes. At this point, I figured I had nothing else to lose, so I grabbed the camera and let him do it again. The powder room door now remains firmly closed at all times. This is what was left of the Chinese food on the floor. This sucked to finish cleaning up. Hey Oliver, what do you have there? 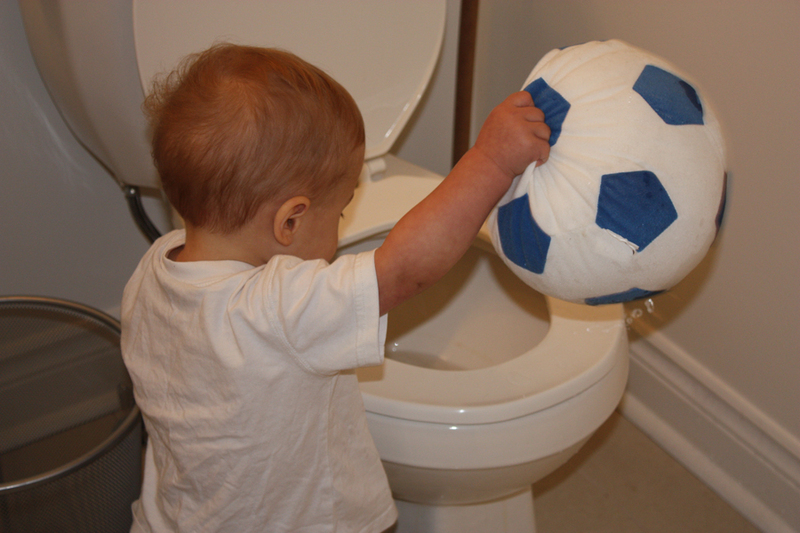 Well look at that, I didn’t know water soccer balls existed! And head out to the hardwood. Of course! 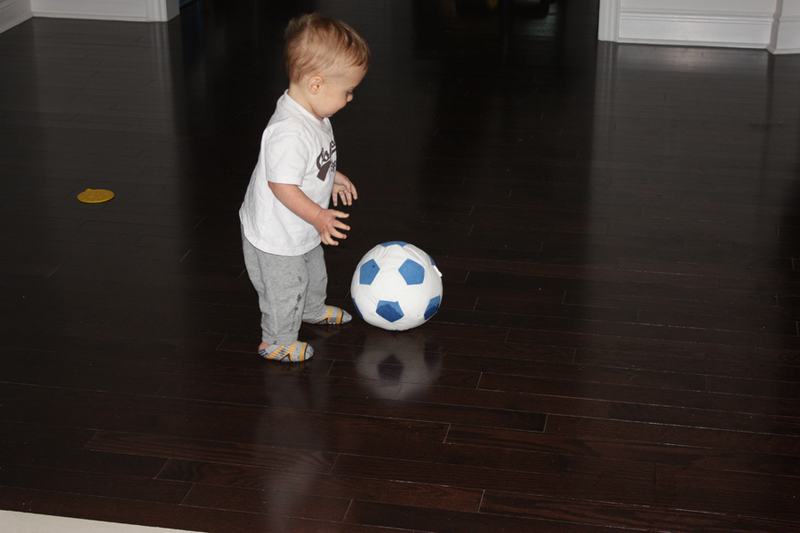 Wet soccer balls always roll better on wood then on tile. After this I put the camera down, picked up my boy, and gave him a giant hug. Then we sat together in the office chair and I emptied out my email. I needed a break before cleaning up the rest of the Chinese food and the water all over the bathroom, front hall, and hardwood floors. Thankfully Bo arrived home about 10 minutes later, then went out to pick up dinner. At least I didn’t have to cook tonight.